Using sustainable architecture principles and its own materials and technologies, Dow Corning has completed construction of two innovative, energy-efficient, high-performance facilities that will significantly improve the company’s ability to meet customer needs, as well as enhance its environmental, health and safety performance. The first is a 32,000m2 distribution center in Feluy, Belgium, that will allow Dow Corning to support future growth in the region, Belgium and Europe. The facility doubles the size of the current warehouse and was constructed in only 15 months. The second is the Solar Energy Exploration & Development (SEED) center located in Seneffe, Belgium. The 9 million Euro addition to Dow Corning’s global innovation capacity includes a Synthesis Technology Center and Solar Application Center and aims to advance fundamental research in new silicon-based materials and solar cell development. “In the construction of those facilities, we have used and prototyped many of Dow Corning’s innovations and novel applications, pushing the limits of technical possibilities in optimising energy use for a laboratory and distribution facility, and answering the sustainability demands of new construction standards,” said Massimo Rebolini, Europe Middle-East and Africa construction industry commercial manager. The main entrance of the distribution center, a surface of 240m2, is glazed with Dow Corning transparent structural silicone adhesive (TSSA). This adhesive, developed for point-fixing in glazing, combines high transparency, strong adhesion, thermal stability and excellent weatherability – all characteristics key to improving a building's lifespan and efficiency. Furthermore, Dow Corning’s structural glazed facade technology allows the creation of modern construction with larger, more efficient windows that enables both providing better thermal insulation and letting in more daylight. Also, more than 2km of concrete floor and wall joints inside the building have been sealed with Dow Corning silicones. Silicone sealants perform well under the stress of UV radiation, extreme heat and cold, and acid rain. Dow Corning’s European Distribution Center incorporates more efficient windows that enables both providing better thermal insulation and letting in more daylight. Dow Corning also invested in special features to enhance energy efficiency. To reduce energy consumption the company further increased the levels of roof insulation and installed heat recovery facilities on the HVAC (heating, ventilation, and air conditioning) systems. To save artificial lighting, the use of natural lighting was maximised via the use of roof lights and where possible motion lighting controls were installed. The structure of the distribution center is also equipped to support solar panels on the roof. Dow Corning’s SEED research center was designed and built with sustainability in mind, using novel Dow Corning technologies, as well as clean energy sources to achieve some of the highest energy efficiency standards. The center is entirely covered with Dow Corning’s new Vacuum Insulation Panels (VIP), which provide high insulating value in materials up to five times thinner than conventional insulation products, enabling maximal use of internal space. The center also uses building-integrated photovoltaics (BIPV), a set of PV modules mounted as sun screens in front of the windows, which reduce the need for cooling in the office area and simultaneously serve as power generators. As a result, the SEED building heating costs are anticipated to be 75 % lower and electricity costs 70 % lower than an equivalent conventional construction. Harvest Housing Group inherited over 120 homes built almost 40 years ago on the Newlands Gardens estate in Workington as part of a stock transfer; the mix of flats and terraced houses all had a poor SAP rating, and were suffering from condensation issues, especially in the roofs. 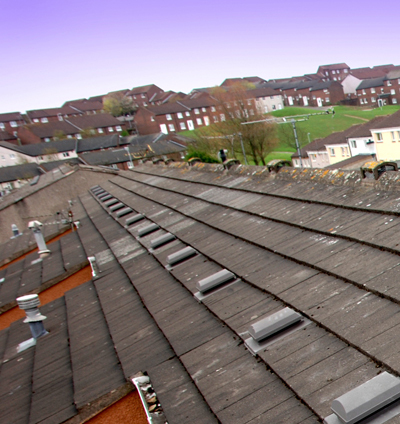 The housing provider called in roof ventilation specialist Glidevale, which worked closely with Harvest to design a strategy which would resolve the roofspace condensation problems as easily and effectively as possible, enabling subsequent upgrading of loft insulation and installation of cavity wall insulation. The solution has been to install Glidevale’s G5 tile ventilators at low level, at 2.0m intervals, supplied through Jewson to contractor Mossam & Sydney. The ventilators have the smallest cowl available on the market, enhancing the overall roofline aesthetics, but still deliver up to 20,000mm2 net free ventilation per ventilator. To make the vents even more discreet, they were colour matched to blend with the existing roof covering. The G5 vents are suitable for use on pitches from 20° to 60° making them even more appropriate for the Newlands Gardens properties’ roofs, which have a shallow pitch. Each ventilator is fitted with Glidevale’s Universal Extension Sleeve, to ensure direct air penetration through the existing roof covering into the roofspace, providing a continuous weatherproof path for the moisture-laden internal air from roofspace to the outside in accordance with both BS5534 and BS5250. Glidevale’s sales director Nick Beswick said: “Preventing harmful condensation with roofspace ventilation has historically been a major consideration in housing specification, but one somewhat forgotten as our climate has been more temperate for a few years. The severity of 2009 and 2010 winters has seen a significant increase in incidence of roofspace condensation, as the warmer, moisture laden air in the roofspace comes into contact with very cold surfaces. The SmartSash window developed by Halo has enabled a new build development in Cwmbran, Gwent, to meet Level 3+ of the Code for Sustainable Homes (CFSH Wales) without the need for bolt-on technologies. When Melin Homes, a registered social landlord, commissioned the first phase of the Woodland Street development it specified SmartSash because it could cost effectively achieve the 0.7W/m2K U-value it required. “SmartSash enabled us to construct dwellings where the fabric itself has a good U-value so that we could achieve Level 3 without resorting to renewable technologies such as photovoltaic cells and heat pumps that may fail and also reduces the problems associated with complicated controls,” explained Lee Pickett, head of construction at Melin Homes. The result, he says, is that there is no danger of the homes later falling to Level 2 or Level 1 through any technical failure of renewables in 10 or 15 years and heating bills are kept low from the start. All white triple-glazed SmartSash casement windows were fitted with Roto TSH30 gearing to so the windows would meet both BS7412, the standard covering the performance of PVC-U windows, and BS7950, the standard specified under the Secured By Design initiative overseen by the Association of Chief Police Officers (ACPO). “Getting triple glazing at a reasonable price together with security systems that were SBD-approved would have been difficult to achieve,” Lee said. Midas Mi-Space, based in Cardiff, built the development of four two-bedroom apartments, four two-bedroom house and four three-bedroom houses while the SmartSash windows were fabricated by Remploy, a supported workshop. The Woodland Street development will give local residents the chance to buy their own homes through the Melin low-cost home ownership schemes. Melin Homes is a major provider of affordable homes in South East Wales and is committed to green and energy efficient housing. It also manages more than 3,400 properties in Blaenau Gwent, Monmouthshire, Torfaen, Newport and Powys. Melin Homes opted for the highest performing version of SmartSash, but the ‘modularity’ of the system enables PVC-U doors and windows to be fitted now to comply with the Code for Sustainable Homes (CSH) Levels 3, 4 or 5 as required – and then be simply, easily and inexpensively upgraded to Level 6 standard at a later date. It also allows for much larger sash sizes, while maintaining thermal performance. This is achieved through glazing elements, which can be changed and enhanced as budgets provide. 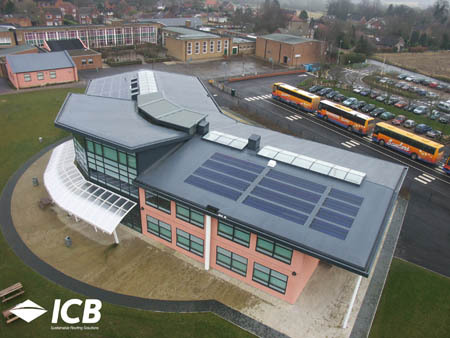 A sixth form college at Reepham High School in Norfolk has retrofitted a series of Alwitra Evalon Solar roof panels across its extensive roof, helping to achieve the architect’s aim of high thermal performance levels, lowest possible energy demand and the highest levels of comfort. Specified by Teather + Walls Architects, Alwitra Evalon solar photovoltaic panels were chosen to accompany the Alwitra Evalon V single ply polymeric membrane that was installed a year before. Applied at an angle of 10°, this would allow for a simple and efficient solar upgrade when funding became available, as well as ensuring the cells would be self-cleaning. For the original roofing application, Total Roofing Services applied Evalon V in dark grey, which is a compatible substrate for the integration of solar PV panels. This flexible photovoltaic roof is capable of producing up to 20% more output than other more common crystalline cell types. Generating power from direct and diffused light, the advanced PV cells can provide 3704kWh of energy per year. The thin film triple junction technology used in Evalon Solar PV cells allows effective harvesting of solar energy on any roof with a pitch of above 3°. Supplied with a 20-year performance guarantee, Alwitra EVALON Solar is one of the most innovative solutions on the market. Keywood, Arch TImber Protection’s new modified timber product, has been chosen by Alistair Baldwin Associates for the design of a decking area within a client's 'zero carbon' garden landscaping project. The homeowner in Harrogate, North Yorkshire, wanted to personally approve all materials chosen by Alistair Baldwin to meet his strict environmental credentials for his home development. 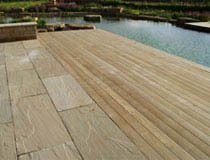 Alistair Baldwin said: “We chose Keywood due to it being a very workable and sustainable material, and also its uniqueness as a pine with the look of a more exotic hardwood. As a designer, I am very attracted to its pale colouring – it takes on the wonderful patina of oak when dry, and then rich warm tones when wet. Recticel Insulation Products has donated more than £7,000 of its Eurothane GP insulation board to a major community refurbishment project organised by an award-winning architect. The board has been provided to help transform a derelict building into a new multi-purpose Community Centre in Dunoon, Scotland. The building was previously used as a Town Hall, but had fallen into disuse. A project was then launched by the John McAslan Family Trust to refurbish the building and create a new resource for the local community. Led by architect John McAslan – who received the accolade of World Architect of the Year in 2009 – the Trust provides assistance to a wide variety of community-based social, education, environmental, arts and sports projects around the world. Recticel’s Paul Simpson said: “This is a multi-purpose board which has a foam core, faced on both sides with a multi-layer, coated aluminum foil. 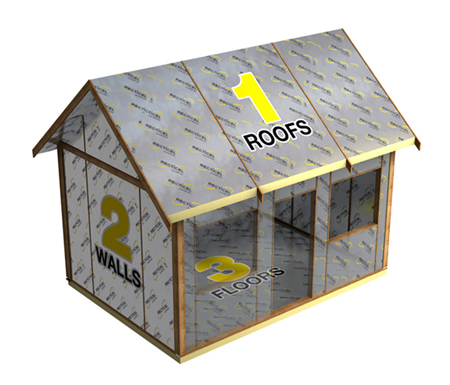 This makes it well suited to the many different types of pitched roofing, flooring and framed wall applications that are often found on this type of project. The John McAslan + Partners architectural practice has offices throughout the UK, and has a long list of impressive international projects to its credit, including the King’s Cross Station Redevelopment, the Stanislavsky Factory in Moscow and the Iron Market in Haiti. CMS Enviro Systems has been appointed as a Scottish Gas registered vendor to a second CESP (Community Energy Saving Programme) refurbishment scheme in Scotland. The contract for Cadder Housing Association in the north of Glasgow is worth in the region of £2million and follows the successful appointment to the £2million Thistle Housing Association CESP refurbishment earlier this year. CESP targets households across the UK in areas of low income to improve energy efficiency standards and reduce fuel bills. CESP promotes a ‘whole house’ approach and is delivered through the development of community-based partnerships between housing providers, community groups and energy companies. As a registered vendor to Scottish Gas, the contract sees CMS supply and install ‘A’ rated energy efficient PVCU windows and doors to Cadder Housing Association housing stock. The energy efficiency and carbon reduction renovation to properties also includes central heating upgrades and external wall insulation. As well as the window and door replacement part of the programme, the CMS scope of work also includes the recycling of all extracted windows and doors at their recycling facilities. On the appointments Scottish Gas Regional CESP Manager for Scotland, Derek Gray, said: “CMS Enviro Systems were awarded these contracts due to their ability and technical experience relating to the supply and installation of superior energy saving PVCU window and door products. They are able to deliver on time, to specification and within budget while retaining the ability to innovate on the contract both commercially and technically, for example recycling all the old windows and doors from the contract. The owner of a seven-bedroomed, nine-bathroom family home in the Midlands has opted for a ground source heat pump system from Danfoss Heat Pumps UK to provide space and hot water heating. The 20kW DHP-S heat pump was installed by renewable energy specialists Be Green of Uxbridge, which also fitted underfloor heating on both the ground and first floors to ensure an effective method of space heating. The heat pump is designed to maintain a constant comfortable temperature throughout the spacious house. The Danfoss DHP-S is a high-capacity heat pump designed for use in large homes and light commercial buildings. It has a built-in de-super heater to provide higher hot water temperatures and an easy to operate ‘set and forget’ control system, which can be monitored and operated from anywhere in the world via an internet connection. 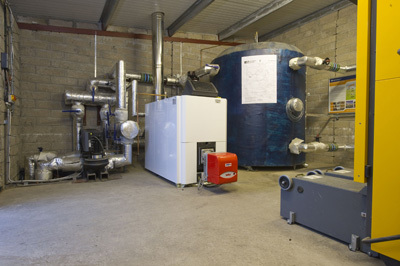 The heat pump supplies all the hot water requirements for the home, which is fitted with a 1,000 litre domestic hot water storage tank in a dedicated plant room. Four 120m vertical energy wells for the heat pump were drilled in land close to the house. Energy wells were chosen rather than a horizontal ground loop because of the geological make-up of the ground, with a hard limestone layer close to the surface which meant it was unsuitable for this installation method. Ground source heat pumps work by circulating a refrigerant fluid around a circuit containing four elements: evaporator heat exchanger, compressor, condenser heat exchanger and expansion valve. Heat absorbed from the ground is transferred to the liquid refrigerant which evaporates to form a gas. This gas is then compressed which causes its temperature to rise. The hot gas passes into the condenser where it starts to change back to a liquid as heat is transferred into the building. After passing through the expansion valve, the liquid refrigerant returns to the evaporator and the cycle begins again. At the Marsden’s home, a Mechanical Ventilation and Heat Recovery system (MHVR) was also installed at the same time and this has further optimised the efficiency of the ground source heat pump. This works in two ways – during winter the system recovers over 85% of the heat from the stale outgoing air. This heat is then fed back into the property as clean, warmed air, thus reducing the amount of heat which the heat pump needs to produce. The MVHR system is also linked to the heat pump’s energy wells, which it uses to create an energy efficient passive cooling system during the summer months. The project was carried out as part of a major renovation of the house, which has included upgrading the insulation to the walls, roof space and under the floors, as well as installing double glazing. HMS Raleigh, the Royal Navy’s premier training establishment in Cornwall, is cutting its carbon footprint by using renewable energy to heat its swimming pool. Specified by Wessex Design, Kier’s specialist energy solutions team supplied Vaillant solar thermal panels, Secon Solar controllers and Bowman heat exchangers for the 33m pool. All new Rating recruits to the Service undergo their nine-week basic training course at HMS Raleigh. The establishment also conducts specialist training delivering seamanship, submarine operations, logistics, military and board and search skills. The heating for the pool at HMS Raleigh was previously taken off the main boiler on site so the decision was made to use renewable energy. On ground level behind the outside of the pool, Kier installed 69 Vaillant VFK145 flat plate solar panels. Two Bowman 4875/5 tube and shell heat exchangers were used to ensure maximum heat transfer between the solar panels and the swimming pool, along with an ES controller and a BX controller from Secon Solar to control the temperature. The Department for Energy and Climate Change has helped to fund over 30 energy-saving projects for the MOD after it was awarded £8.5m in 2008. As well as HMS Raleigh, an improved heating system at Buckley Barracks in Wiltshire has been installed, delivering further cuts in carbon emissions. Kier’s specialist energy solutions team, formally known as Becosolar, was one of the first organisations to become a government-approved installer of photovoltaic cells. 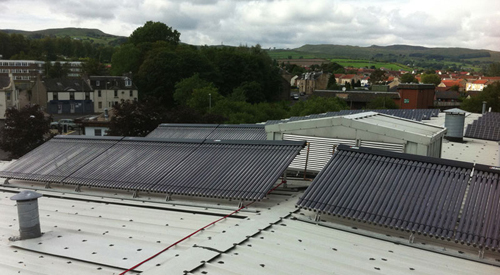 Listed Scottish community building Radio City has installed 240 Kingspan Renewables solar thermal vacuum tubes to meet its extensive hot water needs, while becoming a model of sustainability in the local town of Kilbirnie, Ayrshire. Once a former art deco cinema, Radio City provides much-needed facilities for locals, including a gym, radio station, café, IT, office spaces and beauty rooms. 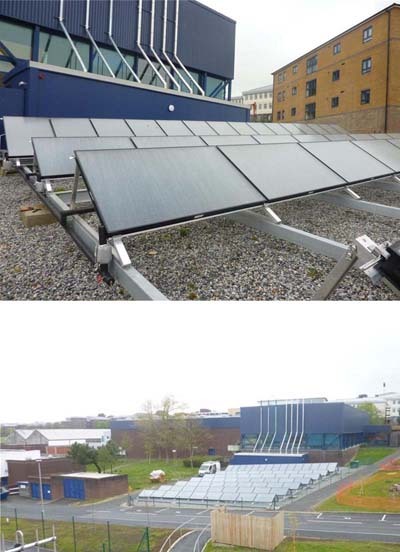 The 25m2 installation of HP200 Thermomax solar thermal tubes was part of a large retrofit project to cut carbon emissions and running costs, which also included fitting solar PV panels to service the building’s electricity needs. Thermomax tubes were specified to feed into a pre-heat system to help meet up to 70% of the annual hot water needs of the multi-use building, including showers and sinks in the gym area. The solar thermal installation is expected to contribute 12.98MWh to the building’s hot water system annually and help Radio City avoid more than 3,500kg of carbon emissions each year. The tubes were specified and fitted by Glendevon Energy, Kinross-based suppliers and installers of solar thermal, solar PV, biomass and heat pump technologies. A key concern for sales director Jamie Adams was meeting strict planning regulations in place for work on listed buildings. He said: “It was a specific planning requirement that the solar thermal collectors did not impact on the view of the building from key vantage points, so we needed to find a solution that would effectively meet the hot water needs of the building without damaging its appearance. Thermomax tubes from Kingspan Renewables are specifically designed to operate in Northern European climates. Up to 50% more efficient than traditional flat plate equivalents, they transfer solar energy into heat, as the vacuum inside each tube insulates the system from outside influences, such as cold weather. This results in quality performance all-year-round, with the vacuum tubes collecting the sun’s energy quickly and efficiently, ensuring solar-heated water is always readily available. 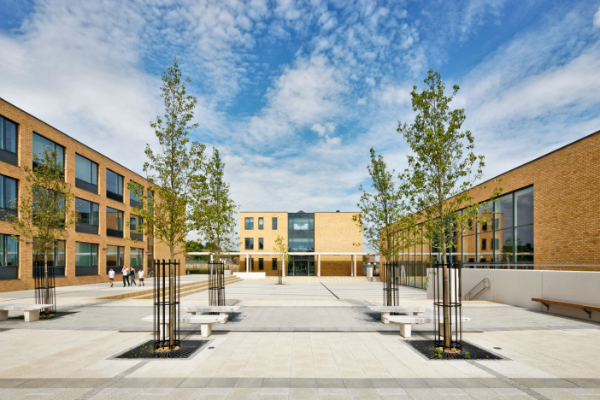 The Queen Elizabeth’s School in Wimborne Minster Dorset, which officially opened last month, features the largest installation anywhere in the world of Rehau’s award winning Awadukt Thermo ground-air heat exchanger system providing a renewable source of controlled cooling and ventilation. To mark its significance, Rehau has created an award at the school which will be presented every year to a pupil demonstrating excellence in Technology and the Environment. 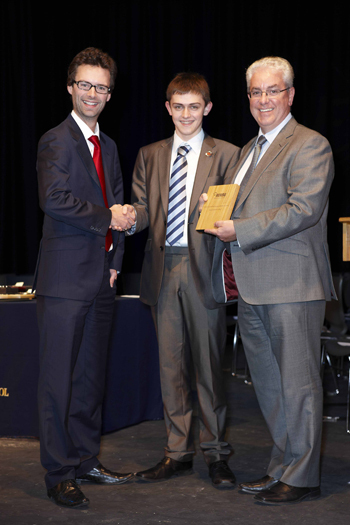 The first recipient was Jack Bedford, the school’s current head boy and environmental champion, who was presented with a suitably sustainable trophy by Graham Hughes, Rehau’s business unit director, at the school’s recent presentation evening. Rehau’s Awadukt Thermo system is installed 1.5m below ground underneath three of the school’s new buildings and uses the natural temperature of the ground at that depth to pre-heat or pre-cool ventilation air before it is delivered into the school. Veka window fabricator Andrew Wright Windows recently completed a contract with Dundee City Council, which used the Infinity suite of recycled profiles for the replacement of 124 windows in council houses in the area. 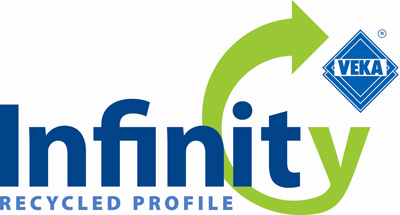 The Veka Infinity profile contains up to 80% recycled content, and is tested to BS EN12608. After Luton Borough Council became the first UK borough to switch entirely to recycled PVC-U for all window replacements earlier this year, many more are now following suit. More recently, the Church of England Diocese of Winchester made the changeover to Infinity windows for all future replacements in its 250 clergy houses. Clover House, a 1960s architect-designed home, is benefiting from the rewards of Warm Wall by Knauf Marmorit to externally insulate its new extension as part of the re-modelling and re-arrangement of the house to provide for the needs of a growing family. The prestigious house located at the top of Kingston Hill, Surrey, is a 200m² building. The project was for a new two-storey extension located at the front of the building, accommodating a new kitchen/dining space and utility room on the ground floor and a master bedroom suite above. At the rear of the building a new first floor bedroom was added over the existing living room. 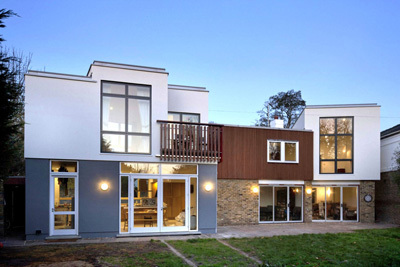 Knauf’s Warm Wall Basis system with contrasting coloured silicon render was used for Clover House to externally insulate and to relate to the existing changes in materials between the ground floor and the timber cladding on the first floor. The Warm Wall Basis system is an economic standard solution that can significantly reduce energy costs and heat loss for a building through the external facade. Knauf Marmorit accredited specialist render subcontractor, EWS Residential, recommended the Warm Wall system. Architect Richard Pain said: “The quality of the surface is excellent – even with the low angled sun of mid November the surface shows no sign of ripple or joint. The colour is even and the 1.5mm aggregate has provided a long-distance smooth surface and a close-up surface of character. “The benefits of keeping a structure warm in the winter and cool in the summer have long been understood by Knauf Marmorit. With no redundant cavity space or brick outer skin the wall can work much more efficiently in the same overall wall thickness.” The project was completed with the silicon based render finish, Conni S, as a water repellent vapour permeable long term protection against driving rain, resistant to algae and fungi, and has an impact resistant surface. A dark grey render is used on the ground floor walls and a white render for the first floor walls. Rehau’s Rauthermex pre-insulated PE-Xa polymer pipework is helping to deliver a new energy efficient district heating scheme for 37 properties owned by the University of Stirling and managed by Link Group in Bridge of Allan, Scotland. The pipework has been installed to provide the district heating main to each of the refurbished properties from a new centralised biomass boiler installed by Angus Biofuels of Forfar. Angus Biofuels was responsible for the design and installation of the complete M&E system based around a 200KW woodchip boiler housed in a newly constructed boiler house on the site. The Rauthermex pipework distributes the hot water underground at a depth of 0.6m from the boiler to heat exchangers located outside of each property, which in turn feed conventional wet radiator systems. Angus Biofuels chose the Rehau carrier pipework with its closed cell polyurethane foam insulation because of its proven quality and performance. Its critical advantage over conventional district heating pipework is its longitudinal stability which means the pipe does not expand or contract due to temperature fluctuations while in operation. Typically, polymer pipe expands by at least 1% (depending on the material) so a 100m pipe run would need to have an expansion allowance of 1m. However, with Rauthermex, no such allowance is necessary, saving money and simplifying designs. The Rauthermex pipework is jointed using Rehau’s renowned Everloc compression sleeve system which produces a permanent, leak free joint and the insulating foam achieves best in class Lambda values of just 0.0255 W/mK. At Bridge of Allan, the district heating main is operating successfully with the boiler and, in line with the stated objectives of Link Group, is helping to deliver a combination of higher comfort levels and lower energy costs for the student tenants in the properties. The pipework was supplied with full design and technical support provided by Rehau’s regional sales office in Glasgow. Saint-Gobain Glass was used in Teambuild, a fast-paced contest in which young construction professionals solved a real-life construction challenge to scoop a £1,500 top prize and a total of £4,600 in prize money. Saint-Gobain Group sponsored the event, which aims to promote understanding and co-operation between young professionals in the construction industry. Now in its 20th year Teambuild attracts teams from some of the best construction firms around the UK and Ireland. 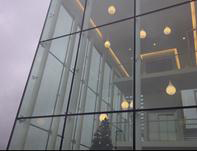 As part of the support by Saint-Gobain teams were required to incorporate key Saint-Gobain products into the solutions they developed including SGG Planitherm One thermally efficient glazing from Saint-Gobain Glass. Other products included: Vario, Saint-Gobain Isover’s advanced air tightness and moisture management system; Glulam from engineered timber specialist Pasquill; and Thistle Durafinish, a hardwearing plaster from British Gypsum. 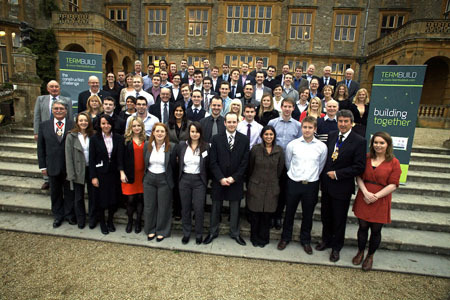 Teambuild 2011 challenged teams to plan, design and deliver a world-leading eco-town development. The Exemplar phase of NW Bicester, developed by a consortium led by P3Eco, was granted detailed planning permission in August. This fascinating project provided the basis for a series of taxing scenarios at all stages of the construction process, watched and scored by eminent judges from all fields across the construction industry. Eight teams, representing 22 top construction companies, made it through to the hotly contested finals. The University Hospital of South Manchester (UHSM) has been actively improving its overall sustainability and its buildings’ energy efficiency for years. In recognition of the hard work at Wythenshawe Hospital, UHSM has been awarded prestigious environmental awards two years running, winning the Guardian’s Public Services Awards in 2010 and the inaugural Climate Week Public Sector Award in 2011. Under further long-term energy and cost saving plans the hospital is in the midst of a window replacement programme, upgrading its existing windows to high performance double-glazed PVCU windows from Spectus Window Systems. The hospital has so far replaced the windows on 10 patient wards as part of the Backlog Maintenance Programme, and the out-patients department is currently undergoing refurbishment too. 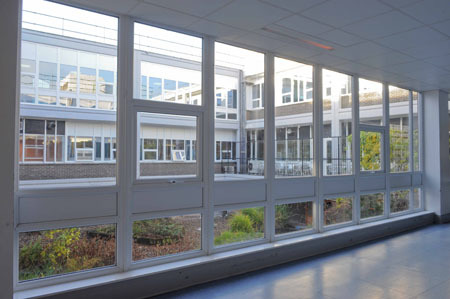 This has seen Spectus Window Systems supply the hospital with over 800 PVC-U windows, some as large as 7m x 2m, through its fabricator Tyldesley Windows, which have been installed by Highstyle Improvements. Using Spectus’ Elite 70 profile, Tyldesley Windows has also produced a new green foiled PVC-U porch for the front elevation of the out-patients department, ready for installation in the spring when the hospital opens its new reception area complete with self-check in facilities. It was Steve Worthington, owner of Highstyle Improvements, who completed the successful tender for the window replacement programme at the hospital. “It was crucial that we could demonstrate best value and optimum sustainability at tender stage,” says Steve. “It was a five-way tender so competition was tough, particularly as UHSM is the UK’s greenest hospital. We recommended that Spectus windows were used because the company is environmentally responsible, with efficient manufacturing techniques that make use of pre-and post-consumer recycled content, and its profiles have an unrivalled in-life performance. The Spectus profiles were glazed with Saint-Gobain’s Planitherm glass to further improve energy efficiency and Solguard glass to reduce glare. They were filled with Argon gas for optimum in-life performance. UHSM’s project manager, Marcus Ashurst, who is overseeing the current outpatient phase of the refurbishment, said: "With efficiency and sustainability at the forefront of the public services agenda, we want to stand as an example of best practice, proving that a hard working hospital can be sustainable across the board. To reduce our carbon emissions, for example, we have introduced biomass boilers that burn wood pellets. This has helped to reduce our energy consumption by 26%, ahead of our target of a 20% reduction by 2012. The new energy efficient windows will certainly contribute to further energy savings going forwards. Balfour Beatty Engineering Services (BBES) has completed the delivery of a major mechanical and electrical (M&E) scheme at Crown Woods College, in Greenwich, demonstrating the multitude of advantages that offsite prefabrication can bring to enable a more sustainable, safer and efficient way of delivering building services solutions. Designed by Nicholas Hare Architects and built by main contractor Balfour Beatty, the new £48 million secondary school, part of the Phase One £100 million Greenwich Council ‘Building Schools for the Future’ (BSF) scheme, features nine buildings linked by external covered walkways. The facility has been organised into three colleges or ‘schools within a school’ with 450 pupils each. In addition there is a post 16 college that will also accommodate 450 students. At Crown Woods College, BBES’s Modular Systems + division has designed and supplied multi-service 3D corridor modules that incorporate full M&E services as well as operating as air conditioning ducts for the classrooms. Lined with acoustic foam, the air path fulfils the design noise criteria to create an ideal learning environment for this new facility. Using the latest lean construction methods and off-site fabrication techniques, BBES has delivered the completed 3D modules and modular risers installed on site for an efficient and safe installation. Manufactured by BBES at its Modular Systems + facility, this allowed site construction to run concurrently, making significant savings on the project timeframe. Using the methods of the Modular Systems + facility in Wednesbury, BBES is able to maximise project efficiency while ensuring quality management is maintained throughout each process. The modular arrangement also eliminates material wastage, helping to maintain projects sustainable targets and provide significant cost and time benefits compared to traditional installations.